Peter awakens to discover that snow has fallen during the night and the city is blanketed in snow. 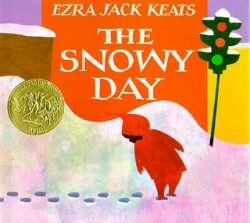 He celebrates the day by putting on his red snow suit after breakfast and heading outside for an adventure. Peter makes a snowman, snow angels, and pretends to be a mountain climber. Before Peter goes back inside he makes a snowball and puts it in his pocket, but when he looks for it before bedtime finds that it is gone. That night he has a dream that the sun came out and melted all the snow, but when he wakes up he sees that it has snowed again. He then makes his way back outside into the snow for another adventure.